Wendy Dio, the wife/manager of legendary heavy metal singer Ronnie James Dio, was interviewed by Eric Blair of "The Blairing Out With Eric Blair Show" at this past Monday's (March 17) exclusive VIP listening party for the Ronnie James Dio tribute album "This Is Your Life" and awards gala at the Avalon in Hollywood, California. Check out the chat below. During the event, fans got to hear the entire album two weeks before they could buy it and there were very special live performances by HALESTORM, Corey Taylor (SLIPKNOT, STONE SOUR), Duff McKagan (GUNS N' ROSES, VELVET REVOLVER, DUFF MCKAGAN'S LOADED, WALKING PAPERS), Scott Ian (ANTHRAX), Tim "Ripper" Owens (JUDAS PRIEST, YNGWIE MALMSTEEN, ICED EARTH, DIO DISCIPLES), Oni Logan (LYNCH MOB, DIO DISCIPLES), Jimmy Bain (DIO, LAST IN LINE, RAINBOW), Rowan Robertson (DIO), Brian Tichy (OZZY OSBOURNE, WHITESNAKE) and many other special surprise guests all performing their renditions of Ronnie's songs. There were also awards presented during the evening, including an award to "The Metal God" Rob Halford of JUDAS PRIEST. Ronnie James Dio is one of the most beloved figures in rock history. His gifts, both as a singer and songwriter, are instantly recognizable, whether he was with RAINBOW, BLACK SABBATH, HEAVEN & HELL, or leading DIO. Sadly, Dio lost his battle with stomach cancer in 2010 but his towering voice and legacy live on. To celebrate one of rock's most powerful voices, an all-star group of his friends and fans recorded 13 of their favorite tracks for a tribute album, 100% of proceeds from which will go to the Ronnie James Dio Stand Up And Shout Cancer Fund. Produced by his longtime manager and wife Wendy Dio, the album includes contributions by such metal heavyweights as METALLICA, MOTÖRHEAD, SCORPIONS, ANTHRAX, and Rob Halford, as well as appearances by many of the musicians who performed with Dio over the years. "This Is Your Life" will be available from Rhino on April 1. A digital version will also be available. Although the songs featured on the album touch on the different eras of Dio's career, several spotlight his time with RAINBOW, including METALLICA's epic, nine-minute "Ronnie Rising Medley", which combines the RAINBOW songs "A Light In The Black", "Tarot Woman", "Stargazer" and "Kill The King". SCORPIONS add a scorching take on "Temple Of The King" while MOTÖRHEAD is joined by Biff Byford from SAXON on "Starstruck". Rob Halford teams with frequent Dio collaborators Vinny Appice, Doug Aldrich, Jeff Pilson, and Scott Warren for "Man On The Silver Mountain". The final lineup of Dio's solo band — Simon Wright, Craig Goldy, Rudy Sarzo and Scott Warren — are joined by Glenn Hughes (DEEP PURPLE, BLACK SABBATH) for "Catch The Rainbow", a track from RAINBOW's 1975 debut. ANTHRAX and ADRENALINE MOB honor Dio's memorable stint with BLACK SABBATH with their takes on "Neon Knights" and "The Mob Rules", respectively, as does a group, led by Oni Logan on vocals along with Jimmy Bain, Rowan Robertson, and Brian Tichy, which performs "I" from "Dehumanizer". "This Is Your Life" also includes songs from Dio's back-to-back platinum albums "Holy Diver" (1983) and "The Last In Line" (1984), with DORO's take on "Egypt (The Chains Are On)", HALESTORM tackling "Straight Through The Heart", Corey Taylor (STONE SOUR, SLIPKNOT) covering the classic "Rainbow In The Dark" and TENACIOUS D (Jack Black and Kyle Gass) putting their signature spin on "The Last In Line". KILLSWITCH ENGAGE's cover of "Holy Diver", a hit in its own right when released in 2006, is also included here. Fittingly, Ronnie James Dio provides the finale (and the album's title) with his moving performance of "This Is Your Life". Originally released on "Angry Machines" (1996), the song's lyrics explore mortality and are backed by a stark and beautiful arrangement that features Dio accompanied only by his longtime keyboardist Scott Warren on piano. The song serves as a poignant reminder that we will never hear a voice like Dio's again. "I'm letting them pick what songs they wanna do in the way they wanna do it," Wendy told Artisan News in 2011. "We reached out to Wendy Dio about wanting to be a part of the Dio tribute that's getting put together," METALLICA singer James Hetfield told U.K.'s Metal Hammer magazine. "We're very honored to be a part of that, and to be a part of a celebration of Ronnie's life and his great contribution, man." In an interview with Guitar International, former ANTHRAX guitarist Rob Caggiano stated that the band's cover version of "Neon Knights" "came out pretty smoking." 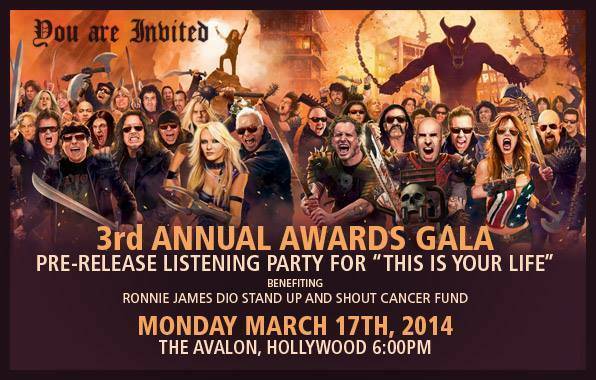 The Ronnie James Dio Stand Up and Shout Cancer Fund is a privately funded 501(c)(3) charity organization which has already raised more than $600,000 in its short history. Monies raised to date have been committed to the cancer research work of the T.J. Martell Foundation for Cancer, AIDS and Leukemia Research and the gastric cancer research unit of the M.D. Anderson Cancer Center in Houston, where Ronnie was treated for gastric cancer during the last six months of his life.